Rob Ford makes Canadians proud: The Toronto mayor's antics make me feel less dorky. Rob Ford delights Canadians by ending their centuries-long reputation for dorkiness. 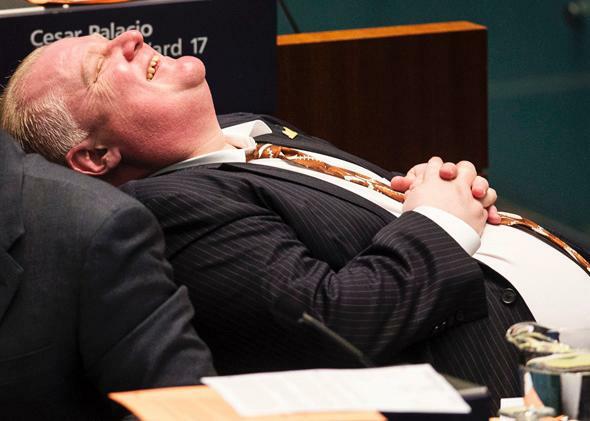 Embattled Toronto Mayor Rob Ford, a proud Canadian, laughs during a city council meeting on Nov. 14, 2013. Like the aurora borealis on crack, the Rob Ford flameout has streaked across the northern skies for days, weeks, even months longer than any sensible political scandal ought to. Long after it was clear that this whole thing needed to be shut down, the mayor of Toronto has continued to take up air and space in world media coverage. Why are we still reading about this guy? The simple answer is that Canadians are too nice to oust even a batshit crazy leader; the more complicated one is that Toronto doesn’t actually have a mechanism to fully remove a batshit crazy leader from public office since it doesn’t happen much. For example: Canada—which created Saturday Night Live in the person of gifted Canadian Lorne Michaels and then built Saturday Night Live through the gifted Canadian-ness of Dan Aykroyd, Martin Short, Mike Myers, Phil Hartman, Norm Macdonald, and others—finally, finally got some serious American respect this past Saturday night when the show opened with a breathless sketch about the full-frontal sideshow of Rob Ford. You’ve come a long way, baby. We’re not just in the big show anymore. It’s finally about us! Until Rob Ford made his crazy-bird appearance on the international media scene, Canada tended to produce and reproduce variations upon a single type. Let’s just shorthand it the “Dorky Observer.” Leonard Cohen is a Dorky Observer; so is Malcolm Gladwell. William Shatner, Diana Krall, David Cronenberg, Samantha Bee, John Kenneth Galbraith, Alice Munro, Margaret Atwood, Donald Sutherland, Alanis Morissette, Marshall McLuhan? All Dorky Observers. David Suzuki is the Über Dorky Observer, as is Mike Myers. Alex Trebek has elevated Dorky Observation into an art form. But Canada produces startlingly few id-based life forms. Even our wackiest prime ministers, Pierre Trudeau and Mackenzie King (who held séances so as to commune with his dogs), were toothachingly proper for the most part. Unlike the rest of us Canadians, who are reputed to live principally in our brains, with only brief forays out for some Timbits and hockey, Rob Ford lives completely in his tremendous body (“I’m happily married. I’ve got more than enough to eat at home.”) with only brief fly-overs to check in on his addled brain. And so Tuesday Rob Ford was on the Today show, being celebrated for his unbridled American-style bonkers-ness. He is being feted by fun-loving people everywhere for his truthiness (“I didn’t lie. I don’t smoke crack, I haven’t smoked crack in over a year.”), for his refreshing honesty (“But show me the video … Because I want to see it. I can’t even barely remember it. I was very, very inebriated.”), and for threatening his colleagues with retribution (“Mark my words, my friends, this is going to be outright war in the next election.”). He is both humble (“I don’t look at myself as the mayor; I look at myself as just a normal, regular person.”) and also freakishly nuts (“Yes, one day I do want to run for prime minister.”). He is unlike every other Canadian who gets to go on the Today show, which must be achieved the usual way: i.e., through exceptional talent. Rob Ford’s 15 minutes of fame has lasted for months. It may, nevertheless, be coming to an end. His official powers have been diminished even further. His TV show has been canceled. But for these sweet months Rob Ford has truly been Toronto’s golem: a ferocious, man-made creature, repository of the group’s worst revenge fantasies, crafted to protect the community from its bloodthirsty enemies. He gets to run around expressing all the hidden violence and madness of the group, so that everyone else can walk around behaving cordially. Here, for the first time, is a Canadian who calls out to the world, whether he’s on crack or off of it: “Hey! I’ll cut you, man.” And, speaking here as the dorkiest of Dorky Observers, deep in our heart of hearts, that feels kind of excellent.